Sometimes you have to stop worrying, wondering and doubting and know that what’s meant to be will always find its way. Have you ever felt uncertain about the future and how things were going to work out? 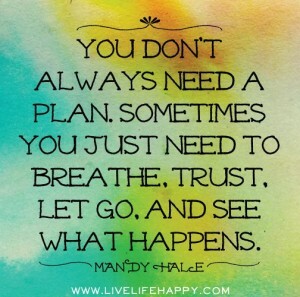 Maybe there’s something really important to you, but you’re just not sure when or if everything is going to work out. Wouldn’t you agree that these times of uncertainty can feel really uncomfortable? We do our best to stay confident and strong, but the doubts linger in the back of our minds waiting for any opportunity to creep up and cast a shadow over the day. When we find ourselves surrounded by so much uncertainty, oftentimes we think that we’ve got to take more control and come up with “the ideal plan”. We do everything we can think of. We work and push day after day, but for whatever reason we continually find ourselves smack dab in the middle of uncertainty … now what? Well, you know what I realized? 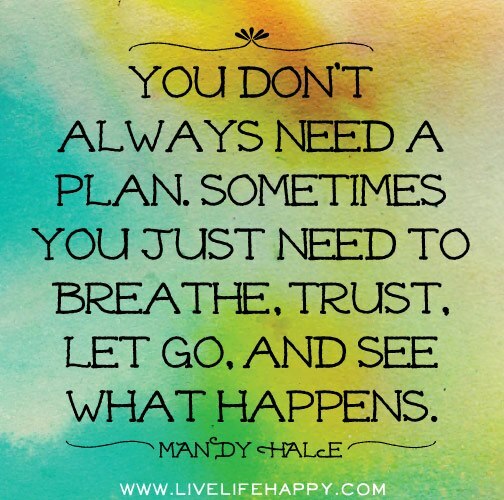 Sometimes when there’s uncertainty, we’re not meant to plan our way out of it… we’re meant to trust our way through it. So, what that means, is that you lean in the direction that feels right, you take continual steps forward, and you trust that every single thing that happens is somehow – someway leading you exactly where you need to be. Easier said than done? Possibly…but, this is something we absolutely can get better and better at doing. It’s just about reminding yourself everyday to trust the way things are unfolding and then you turn your attention to where it always should be … Today and the moment right in front of you. There’s no point in working yourself up and worrying about tomorrow. It’s like one of my favorite quotes by William James explains …“The greatest weapon against stress is our ability to choose one thought over another.” Why waste your time worrying about tomorrow when you can and should be focusing on Today? “What if everything really does fall apart?” … or anything and everything else we have a tendency to worry about. The way we feel as we move through the day really matters and it is always influenced by what we are paying attention to and what thoughts we are choosing. One of the best things we can do is focus on experiencing the moment in front of us in the best way and gently pull our attention back anytime we notice it wandering. This allows us to continually direct our positive energy into all of our experiences, interactions, and anything else we’re doing. It keeps our attention and focus where it’s meant to be … on the moment in front of us. And, there’s nothing more important. How we experience each moment of the day influences everything. It affects what we think, what we do and how we feel as we move through the day. And, of course, it absolutely shapes and influences our tomorrow. 1. Move Through Today (and every Today that follows) With Intent. Remind yourself every morning to move through the day intentionally. Focus your attention on pouring your positive energy into each moment and experiencing it in the best way possible. 2. Replace Uncertainty With Trust. Anytime you feel worried about tomorrow, remind yourself of what you know to be true deep down … everything always unfolds perfectly and just as you need it to. Each time you replace your worries with a reminder of the Truth, you strengthen your belief even more. 3. Catch Your Mind Wandering. Anytime you notice your mind wandering, gently pull your attention back to the moment in front of you. Always remember there is nothing more important than the present moment. Did you like this article? Please share your thoughts in the comment section. If you need to contact me for anything, please feel free to use the contact form or e-mail me directly at (sibyl@possibilityofotday.com). I always love hearing from you.